In a very recent TV interview, the famous physicist says that ‘nothing was around before the Big Bang’. Stephen Hawking claims that time and space was there in a ‘bent state’ that was distorted with another dimension. Sharing his views on the newest episode of the National Geographic show ‘Star Talk’, which was broadcasted on Sunday evening, Hawking, 76, explained the beginning of the universe. The physicist says that the Big Bang was the creation of what we now refer as time because the event broke down the laws of physics as we know it. This means that anything that come first cannot be applied to our current understanding of time and existence. 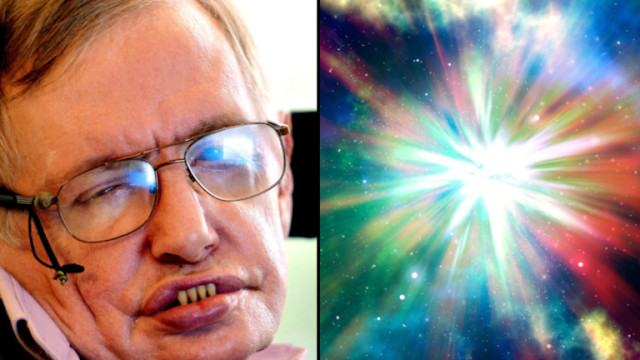 Stephen Hawking uses the idea of space-time to explain his theory, which is measured in four dimensions. To visualize this, think of a horizontal line with past running to the left and future to the right. If you then add a vertical line, this is what Hawking calls imaginary time, and is what was around before the Big Bang. Fundamentally, there was no imaginable ‘boundary’ of time until the Big Bang. ‘The boundary condition of the universe … is that it has no boundary,’ he said. According to this theory, the history of the universe is not a flat line but a four-dimensional, curved object, ‘like the surface of the Earth, but with two more dimensions’, Hawking said. He added that one can regard imaginary and normal space-time as beginning at Earth’s south pole – a point where the normal laws of physics hold. ‘There is nothing south of the South Pole, so there was nothing around before the Big Bang,’ he said. Instead, time and existence fans out from a single point, like the degrees of latitude on planet Earth. According to Hawking, before the Big Bang, the universe was shrunk and condensed to an incredibly dense ball of heat and energy the size of a single atom. Inside this speck, the laws of physics and time as we know them cease to function, and time as we understand it did not exist. If we were to move back in time from the Big Bang, the ‘arrow’ of time shrinks infinitely as the universe becomes smaller, never reaching a clear starting point.